A disappointing first half of the season for Quinnipiac ended on an ugly note. A night after blowing a 3-0 lead before falling 7-4, Quinnipiac gave up a late goal with 24 seconds left giving Maine a 4-3 lead. 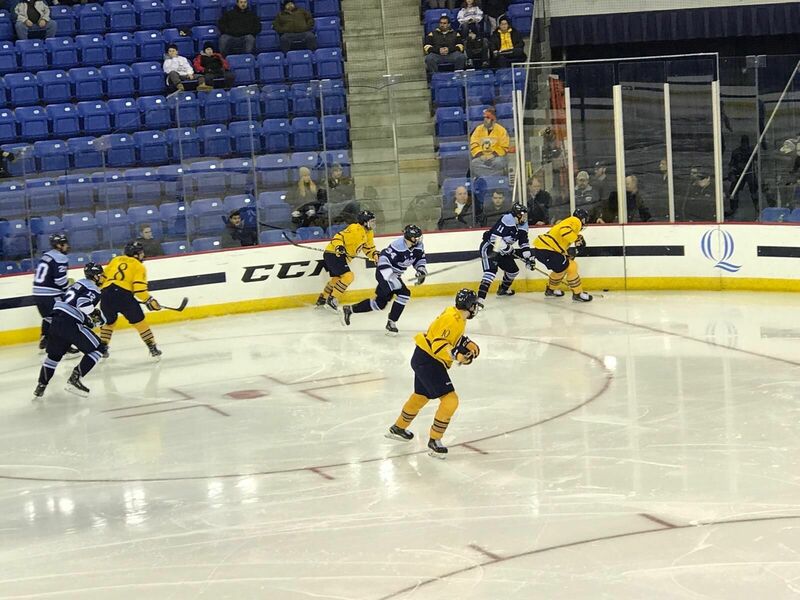 They would add an empty net goal to win 5-3 ending the worst first half of a season in Quinnipiac's Division 1 history under head coach Rand Pecknold as they fell to 6-10-2 on the season. This was the 5th time in the last six games that Quinnipiac has taken at least 43 shots and has failed to win a game. "In my 24 years here, I've never been apart of this many bad bounces, but we got to fight our way out of it. A lot of times, I think you create your good bounces if you work hard and compete, said head coach Rand Pecknold following his teams loss." The Bobcats took a lead in this game in the first period once again when Logan Mick ripped a wrist shot off a Scott Davidson face-off win for this third goal of the season, a night after serving his one game suspension for his hit in the Dartmouth game. Just as they did the previous night when they out shot Maine at a high clip in the first period they did it once again with a 20-5 shot differential in the opening frame. Despite Quinnipiac out shooting Maine 18-11 in the the second period, it was the Black Bears who controlled the scoreboard as they put three past Andrew Shortridge in the period. Emil Westerlund scored 8:44 into the second frame followed seven plus minutes later when Ryan Smith re-directed a shot past Shortridge. Exactly two minutes later Tim Doherty scored on a great passing sequence with Brendan Robbins extending the Maine lead to 3-1. Quinnipiac got back within one in the third period when Landon Smith's hard work to beat an icing call paved the way for a pass to Odeen Tufto who found a wide open Tanner MacMaster who scored through a screen past Jeremy Swayman. 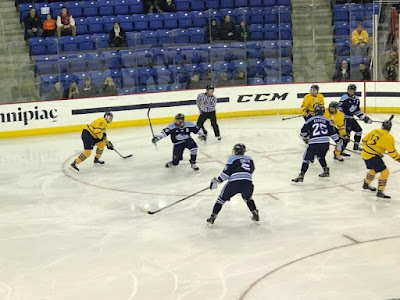 Just under 15 minutes into the period Quinnipiac tied it up when Brogan Rafferty sent a cross ice pass from the half way where Tanner MacMaster was sitting wide open on the door step with plenty of open net in his vicinity tying the game. With 24 seconds left in the game, Nolan Vesey shot turned up a big rebound off of Andrew Shortridge and right to Patrick Shea who fired home the game winning goal high past the Bobcat netminder. Cedric Lacroix added an empty net goal with one second left to give the Black Bears a sweep on the weekend series in Hamden. Andrew Shortridge gave up four goals on 25 shots for Quinnipiac while Jeremy Swayman made 45 saves for Maine and on the weekend in two victories made a total of 95 saves. Quinnipiac doesn't return to action until Tuesday January 2nd when they play UConn and they don't return to Hamden for a home game until January 30th against Princeton as their first seven games in the second half of the season are on the road which is not ideal for a team struggling with consistency and goal scoring this year. They played really well I must say. I was surely amazed by their performance and all of them were amazing. Even the rival team gave its best and it was an amazing match for sure.